For a brief stint I owned a 1995 Audi A6, while living in Parker, Colorado. 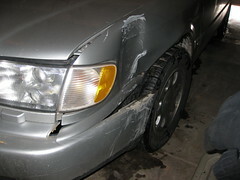 It was the only car, besides my mom's Topaz that I had an accident on the street (that was my fault). Got confidence in your all wheel drive vehicle in the snow/ice? Well forget it, it’s better to drive without it (confidence)! 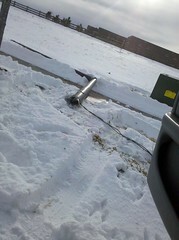 The quattro got a little sideways today, all the way into and through a light pole. You know how they say most accidents happen close to your house? I was only two blocks from home. Apologies to my neighbor who was with me! And to the neighborhood for taking out a street light, fortunately for me it was only a street light and not the trees, or electrical box nearby. 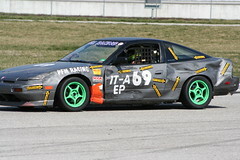 Here’s the carnage of today’s little mishap. And of course the light pole. Lesson learned, another expensive one likely, but learned nonetheless.